This December, two GLOgames Light it Up basketball light kits were donated to Chestnut Mountain Ranch (CMR) by Jim Matuga, president and founder of InnerAction Media through the “Light it Up 4 Kids” and “Boxes for a Purpose” programs. Ruston Seaman is the managing partner of New Vision Renewable Energy and founder of GLOgames Basketball. New Vision Renewable Energy, founded in 2009, is a Christian community development organization working to re-energize communities. It evolved from a rich 50-year history of ministry and development in rural communities in Appalachia and around the world. This rim light fits on any basketball light rim and allows the basketball player to play throughout the night. “After meeting with Ruston Seaman, who is the president of GLOgames, I immediately thought about Chestnut Mountain Ranch and how much the boys there would enjoy this,” Matuga said. What is Chestnut Mountain Ranch? CMR is a christ-centered school and home for boys in crisis. Partnering with their families, CMR pursues family restoration and reunification. Our educational program is geared to help children develop spiritually, intellectually, physically, emotionally and socially. Learn more about CMR here. Light it Up 4 Kids is a simple sponsorship process where a gift of $50 will provide a rim light that will be installed in a youth facility and become available for kids to use. Any person, group or civic organization interested in sponsoring a light or helping identify youth- centered organizations, can go online www.glogames.cool. The first 17 facilities have been identified, and rims are starting to be sponsored and shipped for Christmas. Call 304-457-2971 if you have more questions. Sponsor a Light it Up 4 Kids rim light here. Boxes with a Purpose provides Christmas Eve boxes of fun to children in foster care systems. Learn more about Boxes with a Purpose here. IAM is a Morgantown-based inbound marketing agency specializing in strategic marketing campaigns, video production, website design and development, content creation and social media management. Alicia, a graduate of West Virginia University, received her degree in journalism, specializing in public relations and advertising. 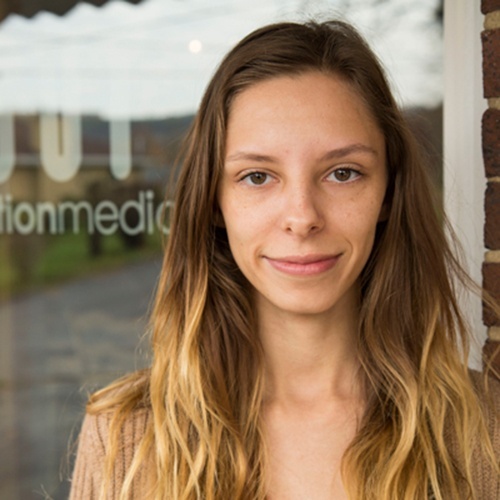 Alicia is responsible for coordinating and developing content for our clients, as well as managing their social media strategy and promotion. Throughout the month, you can find her looking at client campaign analytics, researching relevant awareness months and building out audience profiles to understand clients' target audiences. When Alicia is not developing, promoting or analyzing content, you can find her at the grocery store gathering supplies for the the latest dinner idea, playing chess and talking about the perfect cup of coffee or just trying to learn something new.